How did they get that DNA sample anyway? It’s DNA Sunday here at The Legal Genealogist, and reading about all those old cool DNA results from Neanderthals and other ancient folks (and beasts) got me to wondering: how in the world did the scientists get the DNA to test anyway? Despite the number of people who act in a way that we describe them as Neanderthals, there aren’t any of ’em roaming the streets today. And, last I checked, there weren’t any Ice Age folks or woolly mammoths or any one of a number of other people and critters whose DNA has been tested. So… what did they use? Where did they get the samples? DNA can also be extracted from ancient hair, as it was in the case of a hairball believed to have belonged to a Saddaq, one of the earliest known natives of Greenland, about 4,000 years ago. And now scientists are going after DNA from blood — blood left on the uniform of a New-Englander-turned-Canadian soldier, fighting for the British in the War of 1812, who was badly injured at the Battle of Lundy’s Lane 25 July 1814. Particularly hard hit on both sides was the officer corps. And one of the officers wounded on the British side was a man named Titus Geer Simons. Titus’ father, also named Titus, had been a Loyalist during the Revolutionary War, and the son “a mere lad … was given a musket in the ranks of his father’s corps.”10 Titus the son then went on to his own distinguished career in the War of 1812. 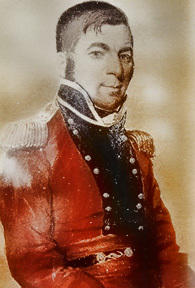 The officer’s coat that Simons wore in that battle was donated by his family to the Hamilton, Ontario, Military Museum; it’s on permanent display there and shows the holes where Simons was shot. It’s said that the entire right side of the jacket was drenched in blood. And that’s where the DNA comes in — and, they hope, will come from. Genealogical reports are that Titus Geer Simons only left daughters.13 That means they can’t use his Y-DNA (passed only from father to son) and they can’t use his mitochondrial DNA (his daughters would have gotten their mitochondrial DNA from their mother and not from their father). So what this lab has to be going for is autosomal DNA. Now how cool is that? — the very first time a blood sample from the war of 1812 will be used for an autosomal DNA test! And his descendant Martha can hardly wait, too! Wow – definitely a Wow idea! Looking forward to the results when they’re completed/published. Fascinating post, Judy. Isn’t this just about the neatest thing you’ve ever seen? I sure hope they get enough to do the testing! Are they still looking for decendents? I’m one of them and this would be so cool! I don’t know, Jamie, but in your shoes I’d sure be contacting the museum in Hamilton to volunteer! How does one find out if they decend from Titus simons? Has the blood been sucessfully removed? I think we have a connection but live in the usa and do not know who to contact. Any help appreciated. Contacting the museum might be a place to start.